Digital marketing is currently empowering companies around the world to interact closely with their target audience. No longer, a company needs to spend millions to establish a direct communication channel with their customers. Digital marketing incorporates electronics devices such as computers, laptops, tablets, cell phones, smart phones, applications and other social networking sites to enable customers to engage with organizations. 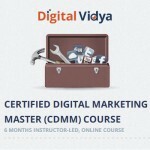 Certified Digital Marketing Master Course (CDMM) is one ideal Master Certification for the aspirants of Digital Marketing, which bestows hands-on expertise and introduces its participants with the insights of Digital Marketing. Earning V skills Digital Marketing Master Certification can help candidate differentiate in today’s competitive job market, broaden their employment opportunities by displaying their advanced skills, and result in higher earning potential. Job seekers looking to find employment in IT or web promotion department of various companies, students generally wanting to improve their skill set and make their CV stronger and existing employees looking for a better role can prove their employers the value of their skills through this certification. What will be covered in the CDMM Exam? Note: All preparation material for this Digital Marketing Master certification will be provided to you with this limited time offer.